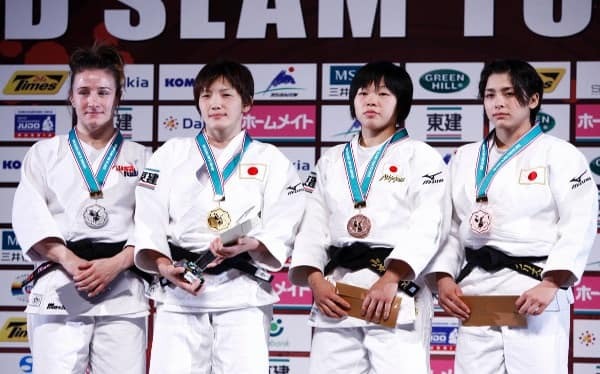 Nearly 400 athletes from 55 nations are competing at the Grand Slam Tokyo. Competition continues today, Saturday in Japan, at 10 a.m. (8 p.m. EST in the United States). See the lineup at WWW.IPPON.ORG. Watch LIVE at WWW.IPPON.TV. Competing Saturday for the United States are: Alex Jacobson, 73 kg., Jonathan Fernandez, 81 kg., (Baragua Judo Kai, Miami, FL), and Olympian Travis Stevens, 81 kg, (USA Judo Training Site, Pedro’s Judo Center/NYAC, Wakefield, MA). Stepping onto the tatami Sunday in Tokyo for the United States will be Colton Brown, 90 kg. (USA Judo Training Site, San Jose State University Judo, San Jose, CA). Yesterday, U.S. Olympic Bronze Medalist Marti Malloy went 4-1 in the homeland of judo to take a silver medal, adding yet another victory to solidify her stature as a world power in the sport. Click here for the full story from USA Judo. Click here for match-by-match details. This entry was posted on November 30, 2013 at 4:25 pm and is filed under Competition Video, Judo News. You can follow any responses to this entry through the RSS 2.0 feed. You can leave a response, or trackback from your own site.